The Vigil brings no easy explanations — every night is a new mystery, a bizarre creature, an unknown terror. But hunters are humans, and humans must categorize — they take notes, keep journals, snap pictures and attempt to illustrate the horrors they meet on the hunt. By doing so, hunter cells try to find patterns, solve enigmas, and most important of all, keep hold of their sanity in these long, dark nights. • An “artifact” book detailing the secret files of a lone hunter cell operating in the city of Philadelphia. 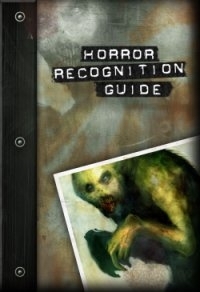 • Can be used as a prop in any Hunter: The Vigil game, or can be used by Storytellers and players as a resource from which to draw new encounter and story ideas. • Digs deeper into the mysteries surrounding the monsters of the World of Darkness (those known as well as many that remain singular and uncategorized) as well as the strange compacts and conspiracies that hunt them. • Connects with the Hunter: The Vigil corebook and its supplements by reintroducing and revisiting ideas, locations and characters (the city of Philadelphia, Alicia Mangum, Michael Moryken, Emily the Talisman, the Chevalier Theleme, and more). This title was added to our catalog on February 18, 2009.